This single-volume reference covers the natural course, treatment, and management of all neurological diseases affecting the brain, spinal cord nerves and muscles. This comprehensive text reference seeks to assist physicians with treatment by providing an easy-to-use compendium covering the treatment and management of all neurological diseases along with details on the natural course of these diseases. 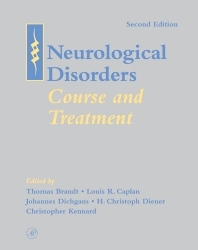 Organized for ease of use and quick reference, each chapter presents a neurological disorder or key symptoms and systematically discusses the clinical syndrome and differential diagnosis, natural course, principles of therapy, and practical management of each. Neurologists, neurosurgeons, neuroradiologists, pediatric neurologists, psychiatrists, internists, general practitioners, opthalmologists and otolaryngologists. Acute and Chronic Pain. Cranial Nerves and Brain Stem. Cognitive and Behavioral Disorders. Cerebrovascular Disorders. Infections and Inflammatory Diseases. Intensive Care in Neurology. Tumors and Developmental Disorders. Metabolic and Progressive Disorders. Movement Disorders. Muscle and Peripheral Nervous System. Endocrine and Autonomic Function. Neurological Side Effects of Therapy. Molecular Genetics of Neurological Disorders. Tufts University School of Medicine, Boston, Massachusetts, U.S.A.